Hey guys, here's my latest Mood Board Design. I have a client who's family room was feeling outdated, heavy and a little dark with her brown leather sofas. But buying all new furniture isn't in the budget. 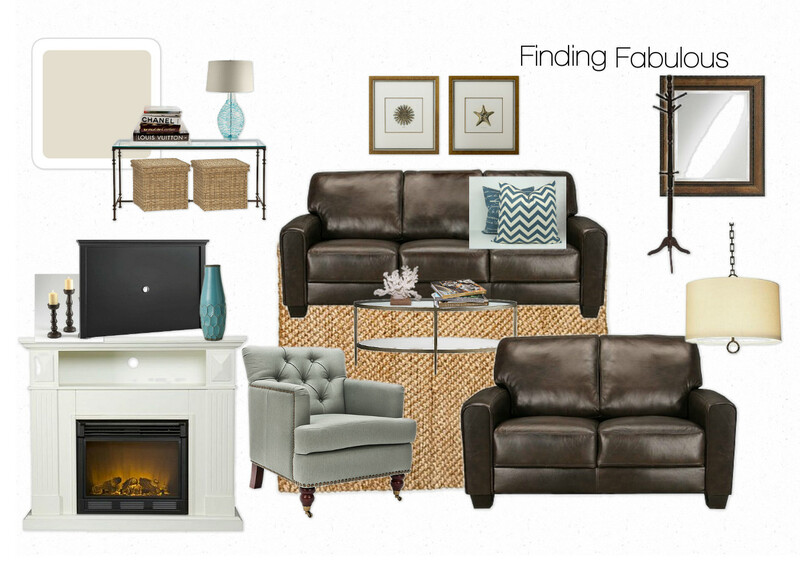 My design plan...keep the sofas and neutralize the room with soft earthy colors and textures. Here we've got a sisal rug, glass tables...and a cool blue club chair and pillows. The overall look is coastal casual, and even with those dark sofas...still light and airy! Okay, taking your existing sofas and creating a whole new room design that's chic and updated (and affordable)...this is what Finding Fabulous by design is all about. Go here to learn more about my services. I love the hints of turquoise/teal. Have a great weekend!